This interesting surname is a diminutive form of Page, which is of Old French origin, and an occupational name for a young servant, a personal attendant in a noble's house, from the Old French, Middle English "page", ultimately deriving from the Greek "paidion", a boy, child. Padgett itself contains the intrusive "-d-", due to dialectal influences, and the diminutive suffix "-ett"; hence, "little page". 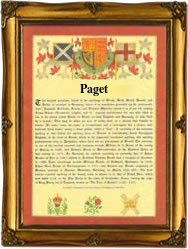 Variants of the surname in the modern idiom include Paget, Pag(g)itt and Pagett. A family called Paget, of humble origins, first became prominent when William Paget (1506 - 1563) acquired large estates from Henry V111 on the dissolution of the monasteries, and also held the title Earl of Uxbridge, from 1714. The surname Page is first recorded in 1230, when Ralph Page is mentioned in the Pipe Rolls of Devonshire, while the variant form Padgett first appears in the early 14th Century (see below). John Paget is recorded in 1359 in the Court Rolls of the Borough of Colchester. Jone Padgett was christened at St. Botolph's, Bishopsgate, London, on December 10th 1569, while Margaret Padgett married Robert Ellis in London, on September 28th 1597. The Coat of Arms most associated with the family depicts on a black shield, a silver cross engrailed, in the dexter quarter a silver escallop. The first recorded spelling of the family name is shown to be that of William Paget, which was dated 1327, in the "Subsidy Rolls of Sussex", during the reign of King Edward 111, known as "The Father of the Navy", 1327 - 1377. Surnames became necessary when governments introduced personal taxation. In England this was known as Poll Tax. Throughout the centuries, surnames in every country have continued to "develop" often leading to astonishing variants of the original spelling.